Start with 2 quarts any basic chicken broth, homemade or store bought cartons. Bring to boil. Add ½ cup (any type) rice or orzo, and season the broth with salt and pepper. Simmer over low heat for 20 more minutes, until the rice is tender. When the rice is done, turn off the heat. Beat 5 eggs in a blender until light and frothy. 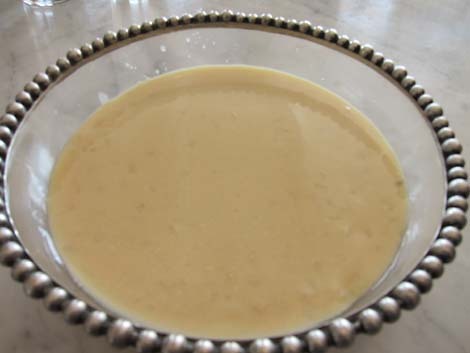 Pour in ½ cup lemon juice and 1 tablespoon flour. Whisk one ladle full of hot broth into the eggs slowly so the eggs do not curdle. Gradually whisk in more broth until the egg mixture is heated. Then pour the egg mixture back into the pot, whisking briskly. The result should be a creamy, cloudy looking soup. You may season with additional salt, pepper or lemon juice at this point. Cook over low heat for about 5 minutes stirring constantly. You may add pieces of chicken to the soup before serving. Kalosorisate means welcome in Greek. There is nothing like Greek hospitality and the warm and sincere welcome one receives when you are a guest in a Greek home. The Greeks have a love for leisurely socializing and entertaining. The photo I sent you is typical of a Greek Easter. In this particular photo relatives came from as far away as Cleveland and Florida to spend the holiday with us! It is not unusual to have 50+ guests for dinner. If you are not Greek, you become a little bit Greek after one of our Big Fat Greek celebrations! My egg lemon soup recipe I submitted to Heirloom Meals was passed down from my mothers grandmother Katerina Moschokarfis. She taught her daughter Angeliki Psilos to make the recipe who then taught my mother Theodora Soropoulos to make it. My mother taught me, Francine Soropoulos Kyriakos and I make Avgolemono soup with my two daughters, Anjelique Theodora and Elena Lia. . It has been passed down for at least 5 generations of our family. Avgolemono soup is a nourishing addition to a meal or can be a meal in itself. It is a classic Greek soup often served in Greek diners and restaurants. Its taste is tart and unique. It graces our holiday tables when served before the entrée as well as being the center attraction for a late Sunday afternoon snack. It is creamy, delicious and easy to prepare. If you are not feeling well, any Greek mother knows Avgolemono Soup will cure everything! Do not allow soup to come to a boil or the egg will curdle. If you use rice - it is gluten free! !